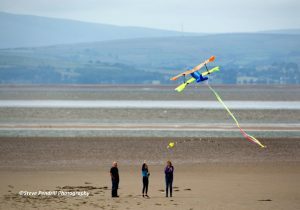 Morecambe’s annual ‘Catch The Wind’ kite festival is a delightful and colourful free event and having a wedding free Saturday, I thought I’d pop down for a look with my camera in hand. 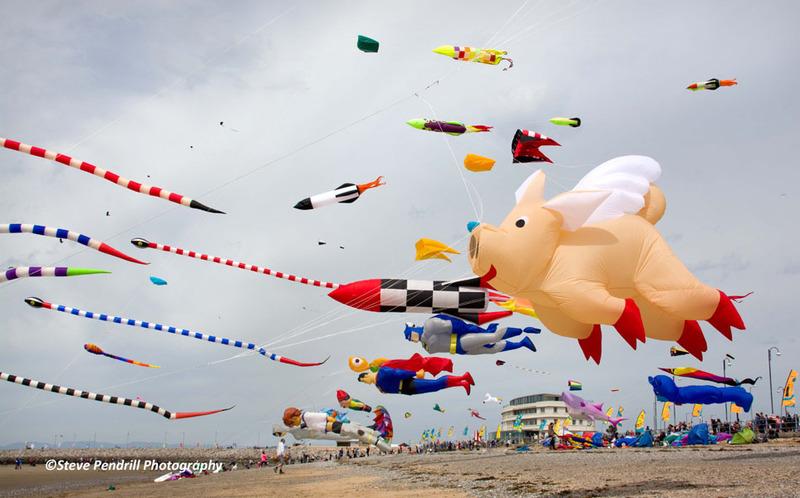 Apparently pigs do fly in Morecambe! 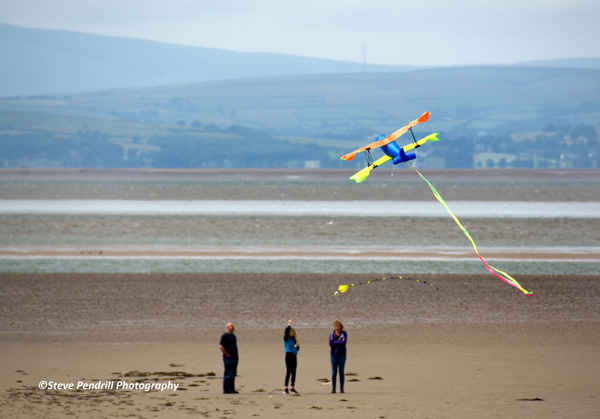 Some of the many kites flying over the beach. When it comes to photographing an outdoor event I like to look for something unusual or comical and that certainly is a theme at the kite festival! 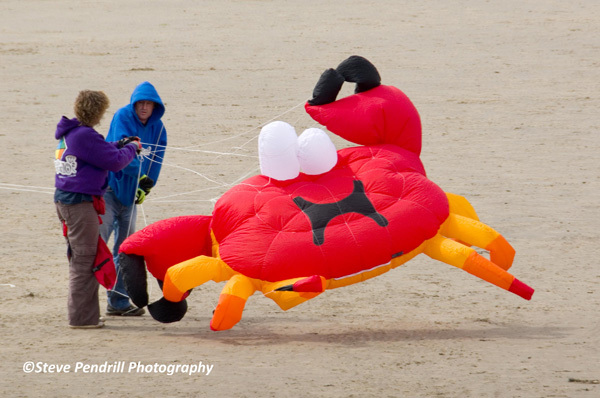 Every year some of the visiting kites seem to get bigger, more elaborate and more bizarre. One of my personal favourites was Superman, who was in good flight and made quite a spectacle. 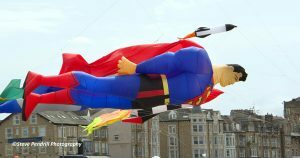 Superman flies over Morecambe’s West End! The photo below was one I carefully planned. 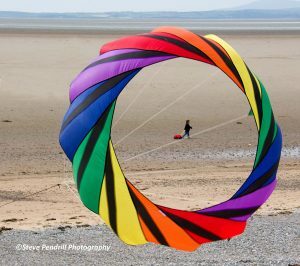 The small child walking across the beach I thought would look interesting framed in the centre of the hollow kite. I was lucky not to have a clutter of distractions in the shot and took several attempts to get myself in the right place. All was made rather tricky because it was very breezy and the kite was darting from side to side, making ‘targeting’ very difficult. 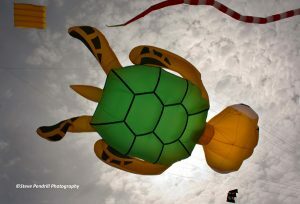 Kites of all shapes and sizes. I changed position to try a shot looking straight up at a kite flying directly above. I made use of the sun behind it, giving it a slight glow as well as making the surrounding clouds an added interest. A hazy sky did soften the image so I added a little contrast in Photoshop to make it more striking. 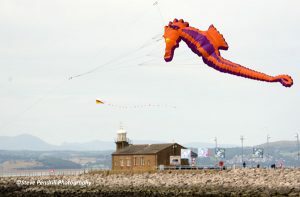 A seahorse looks down on Morecambe’s stone jetty with a fine view of the Bay behind. Not all kits are designed to leave the ground as I discovered. 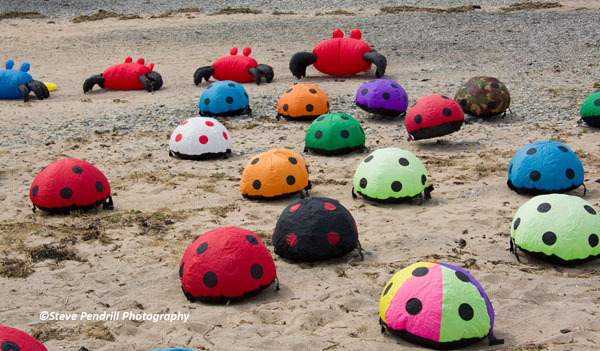 This bunch of colourful bugs dancing on the beach made a curious sight.